In episode four of ‘Feel Good Food’, I share interesting facts I bet you didn’t know about capsicums. Did you know that green capsicums are actually unripened yellow or red capsicums? That’s why a green capsicum will always taste a tad more bitter than a red one. Did you also know that if you sprinkle cayenne pepper (a variety of capsicum more suited to drying) in your socks it will keep your toes warm in winter. It works! Give it a go. 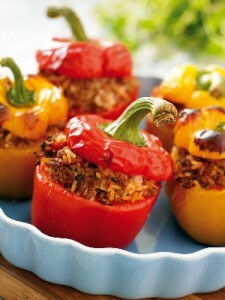 Get the delicious and easy to make Roasted Stuffed Capsicum recipe from the pages of my book, From Paddock to Plate.